Sumo is a Japanese style of wrestling where the object is to force your opponent to touch the ground with any part of their body other than the soles of their feet, or to step out of the ring (dohyo). In robot sumo the aim is to push your opponent out of the ring. 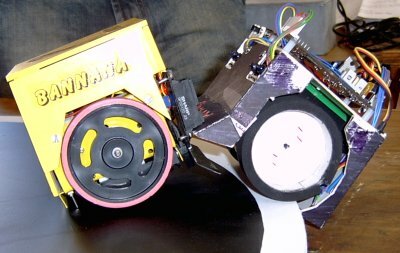 There are two styles of robot sumo, Radio controlled and Autonomous, with "mini sumo" being one of the many size/weight classes of competition. Surprisingly the solutions to Autonomous MiniSumo are not necessarily complex or expensive. This site aims to introduce minisumo in easy steps and, while staying competitive, at a budget price. What's presented here can be applied to other robotic projects and scaled up or down into the other classes of Robot Sumo. To compete in the MiniSumo class our 'bots will need to stay within the 500g weight limit and, in their starting position, fit within a 10cm square. There is no height restriction in this class of sumo, but this it is not common to all classes. This site is growing, lots to do, lots to write. A general To Do List of what's to come can be found in the forum.